Outlander concludes its fourth season with a birth, a conclusion to the finding Roger plot and a massive change in circumstances for some of the characters. Sometimes it’s easy to forget just how much time passes between episodes or within the span of a single episode in this show. A lot of it has to do with the passage of time not being a focus of the plotting. What normally happens is that scenes will run together and dialogue will clue the viewer in on them taking place weeks or months apart. It can be fairly jarring as the characters don’t change an awful lot between those scenes so the significant time passage feels insignificant. It’s a necessary conceit in this show as the time period means that it takes a long time to travel anywhere. 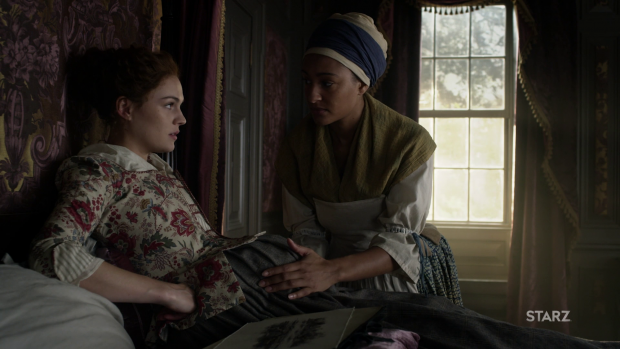 The point I’m driving at is that it’s surprising that Brianna is at the stage where she is about to give birth after falling pregnant only a few episodes ago. This episode does make good use of the mundanity of her existence at this point through Jocasta pointing out that Brianna doesn’t really do much beyond drawing and staring into space hoping that her parents will return with Roger. She’s basically holding her breath hoping that Roger will return to her and since she’s living her life in luxury it will be somewhat uneventful. Brianna’s drawings act as a metaphor for her frustrations. She makes reference to not being able to get it right which suggests that there’s something about her life that feels incomplete. The drawing can’t be completed to her satisfaction because she’s unable to settle until she knows Roger’s fate. It’s a subtle detail but it makes Brianna’s art meaningful and an important part of her character. This supports my suggestion that she may end up finding her path in life through her journey to the past. The tendency to move time forward at a considerable pace ends up robbing story beats of some of their power. A clear example of that is the birth of Brianna’s child. We go from her seeing her son for the first time to a few weeks later without getting any sense of how motherhood affects her. It may be that River Run will make the early stages of raising her child a lot easier than it would have been on her own but the gap in that stage of her life is certainly felt. It’s unclear if being a mother overwhelmed her in any way or how she reacts to being responsible for this young life. A similar problem existed when Brianna was born so the writers aren’t learning from their past mistakes when it comes to skipping significant character beats. 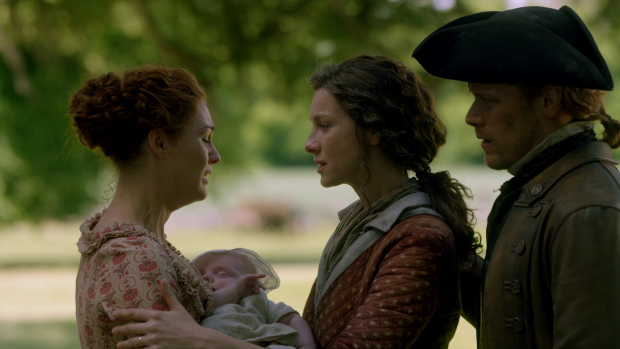 Brianna’s reunion with Jamie and Claire was really well played. The absence of Roger in that moment was definitely felt and the look of disappointment on Brianna’s face was perfectly played by Sophie Skelton. It’s a moment that is very light on dialogue which intensifies the emotion of it and makes use of the talented cast to convey the weight of it with very few words. It’s impactful and expertly handled. The absence of Roger in this moments builds on the open question left at an earlier point in the episode when Claire and Jamie fill him in on everything that has happened since the misunderstanding led to Roger being sold to the Mohawk Tribe. He learns about Brianna’s pregnancy but also learns there’s a good chance that he’s not the father which presents a clear choice to him. Does he accept the child as his even though it might not be his in a biological sense or does he return to his own time and absolve himself of any responsibility? Claire and Jamie make it clear that he has to reach a decision and stand by that decision and Claire understands that it’s a lot for Roger to take in so recognises that he needs time to process it and really commit to his decision. We don’t see him agonise over this and the clear implication is that not coming back with Claire and Jamie means that he has decided to return to his own time to cut his losses in an attempt to move on with his life. Roger’s interactions with Claire and Jamie are about as emotionally driven as you’d expect and Jamie allows him to vent his frustrations by hitting him because he feels that it has been earned after what Jamie did to him. The conversation is largely focused on setting the record straight and figuring out how to move forward which it certainly accomplishes but the real aim is to resolve Jamie’s guilt over jumping to the incorrect conclusion and allowing Roger to work out his feelings about the whole situation. It’s clear that there is a long way to go before Roger will be able to forgive Jamie and the tension that exists between them is great to watch. Jamie behaves reasonably but still takes charge of the situation. He allows Roger to vent his frustrations but doesn’t let him go too far as the important thing is making him aware of the choice that he has to make. Roger’s reaction makes a lot of sense given the circumstances as it is only natural for him to be blindsided by such unexpected news. This highlights the complexity of the situation as what happened to Roger might have been terrible but they are short on time and dwelling on it won’t be in any way productive. The important thing is getting back to Brianna at which point there will be time to deal with the intricacies of Jamie’s actions. Roger’s arrival at River Run makes for a wholly satisfying reunion. Brianna running to him before embracing him is beautifully shot and the music conveys the emotion of this wonderfully. He makes it clear that he will stand by Brianna. There’s a great deal of sincerity in his voice and body language suggesting that he’s fully committed to living a life with Brianna and raising the child. Hopefully this will provide an opportunity to explore their relationship in great detail next season. I’ve repeatedly mentioned that the portrayal of the various Native American cultures in this show has been problematic. Unfortunately this trend continues in this episode as the Mohawk are portrayed more as unpredictable antagonists than a fully formed tribe with its own culture, traditions and rules. It’s definitely the wrong move as it does absolutely nothing to turn them into anything more than an add-on to the stories of the main characters. There are no developed characters among the Mohawk which makes them feel like a plot device more than anything else. There is a sense that there is an attempt to fix that through the story of Otter Tooth (Trevor Carroll); a visitor from the future who tried to inspire the tribe to go to War against the white man to protect their way of life. Considering how long ago the idea of a Native American visitor from the future was teased this feels like a bt of a last minute information dump in a shallow attempt to add some depth to the Mohawk. It does add context to what Claire experienced and does a little bit for the mythology of the show through confirming that there is a tangible connection to Otter Tooth through the stone that he carried. It represents what he apparently stood for to the Mohawk but also suggests that he might have led them down the wrong path. With more work Otter Tooth’s influence could have been a fascinating through line that made the Mohawk an essential part of the world this show inhabits. What we get here just feels clumsy and rushed. Ian’s decision to trade himself for Roger provides a real opportunity to make up for the mistakes made this season. Ian is very quickly accepted by them after passing “the gauntlet”. Naming it finally gives context for the beating Roger endured upon arriving at their village and starts to flesh out their customs. By passing it Ian proves himself worthy of equal treatment and earns a place among them. Hopefully his unique position will be exploited to its full potential and Ian will become the audience viewpoint for a well developed Mohawk culture. It has already been established that Ian is working to understand Native American customs and passing the Gauntlet shows that he respects it so this is definitely something the writers could and should make use of. Jamie was first to sacrifice himself in favour of Roger and pledged to return to Claire at some point. I’m glad that Ian traded himself because it could be penance for him selling Roger to them in the first place but on a deeper level it’s part of Ian finding his place in the world as this is something he has been struggling with all season. This has ranged from dealing with the sexual assault to having difficulty feeling useful in the New World so it’s clear that he sees this as something that he could and should do. Jamie’s sacrifice would also have less meaning because he would be constantly trying to escape which shows blatant disrespect for the Mohawk culture since he wouldn’t consider the trade with them worth honouring. Ian respects them and is eager to prove himself. The scene where Ian parts from Jamie and Claire is incredibly moving. All parties let their raw emotions come to the surface and the weight of the moment is definitely felt. Jamie followed Ian across the ocean to rescue him so feels responsible for them and they have grown very close over the time they have spent together so their parting is significant. Sam Heughan’s performance when he tells Ian that he is a man of worth is heartbreaking to watch and the whole exchange makes for another classic Outlander character moment. I’ve always said that this show is at its best when focusing on the characters and moments like this continue to prove me right in that regard. Another engaging series of interactions are those between Murtagh and Jocasta. The way they continually challenge one another is really compelling as they both seem fairly set in their ways so having an open challenge to their way of thinking often results in something entertaining. In particular Murtagh calls Jocasta out on her life of luxury at the expense of those suffering that she apparently ignores. Murtagh’s anti-establishment stance is well established at this point so bouncing off Jocasta who represents the landed gentry really does get animated. Eventually it gets personal with Jocasta bringing up very old resentments and suggesting that she finds him to be no different now. Having this end with them sleeping together feels oddly appropriate considering how turbulent their relationship is. Whether this will grow into a fifth marriage for Jocasta is anyone’s guess but for now it makes for compelling and amusing drama while also offering Murtagh somewhere to hide as the authorities hunt him down. I must admit that I’m struggling to wrap my head around the familial connection Murtagh has to Jocasta. I’m sure there is one but given the complexities of the Fraser Clan and how the family tree works I’m unsure what it actually is. Perhaps someone can enlighten me in the comments? 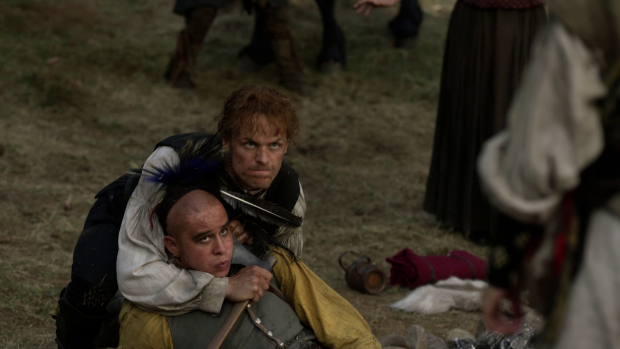 The episode ends with Jamie being summoned by Governor Tyron to hunt down Murtagh. Naturally this is a complication for Jamie and confirms one of the fears he and Claire had before deciding to accept his offer of land. This is going to be very difficult to get out of and I imagine not producing results won’t be tolerated. As cliffhangers go this is fairly week as it feels like something that would carry into an episode airing next week rather than a note to end the season on. Previous seasons have ended with the promise of a complete paradigm shift for Claire and Jamie but this ending leads the audience to expect more of the same. It also feels needlessly overdramatic as it’s obvious Jamie won’t be able to betray Murtagh no matter what promises he made. A solid episode that delivers excellent character moments but fails to end the season on a satisfying note. The uneven portrayal of the passage of time continues to hinder this show as it feels like major events are being skipped over. One such example of this is Brianna giving birth to her son before cutting to a few weeks later without spending any time showing how she takes to the early days of motherhood. It’s a clear missed opportunity and downplays the importance of this life changing event. Jamie and Claire bringing Roger up to speed on recent events while Jamie lets him vent his frustrations for a little while before bringing him back on task to deal with the current situation makes for engaging viewing as it is very emotionally driven in the right way. Roger not immediately deciding that it doesn’t matter to him who actually fathered the child makes the moment feel all the more real as well as it’s only natural to be blindsided by such unexpected knowledge. 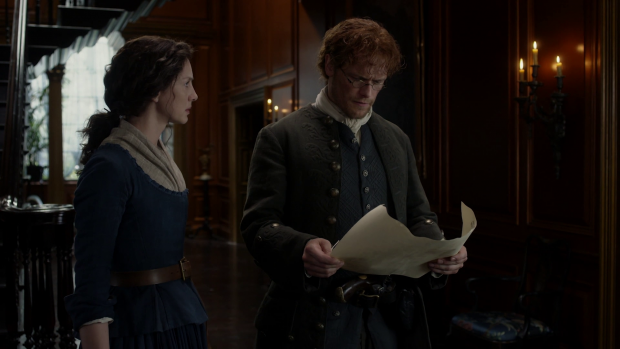 Claire and Jamie’s arrival at River Run is brilliantly played with the actors doing so much without dialogue to convey the emotion of the situation. Similarly the return of Roger is wonderfully shot and scored to underpin the emotional heft of the situation. This episode makes some attempt to add depth to the Mohawk culture but doesn’t do enough to make up for past mistakes. Ian’s decision to trade himself for Roger works really well as it completes his arc focused on finding a place in the world for him while making good use of establishing that he has made some effort to understand Native American culture. He respects them and passing the Gauntlet provides some much needed context for what the Mohawk Tribe value. It’s an engaging start and delivers a real opportunity to build on this through Ian’s perspective next season. Ian’s parting from Jamie and Claire is beautifully played by all of the actors concerned and numbers among the classing Outlander moments. The backstory of Otter Tooth as a way to justify prior actions isn’t enough as it feels rushed and only highlights that there was a chance to develop this over a longer period of time that was missed. Jocasta and Murtagh’s interactions are a joy to watch because of how much they challenge one another’s stubborn points of view. Murtagh calls Jocasta out on living a life of luxury rather than doing something constructive with her influence and Jocasta remembers butting heads with him long ago. Having this result in them sleeping together feels oddly appropriate and creates an engaging dynamic to be further explored. The episode ends on Jamie being ordered to hunt down Murtagh which feels fairly weak as a season ending cliffhanger. Previous seasons have ended with a paradigm shift for Jamie and Claire but this one feels largely like more of the same. There isn’t a lot to go on in terms of next steps for the show going into season 5. Of course there is Jamie’s order to hunt down Murtagh which he will obviously try to work around somehow at great risk to himself. 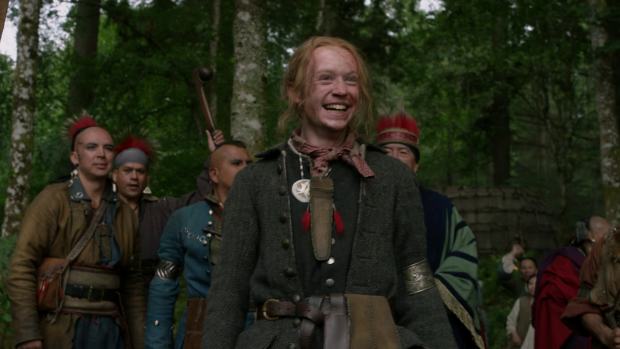 There is also the suggestion that Ian might have an independent plot focused on him integrating himself into the Mohawk culture which will definitely bring its own challenges especially if their beliefs and principles clash with his in some way. Brianna and Roger’s relationship should have time to develop along deeper lines as they become used to being parents. Stephen Bonnet is still out there and believed death so I’d be surprised if he doesn’t come looking for her and his child at some point. Bonnet is a terrible person but an engaging villain so that could very well be interesting. Another thing the show needs to build up to is the upcoming fire that apparently claims the lives of Jamie and Claire. It’s the reason for Brianna being in that time period and it’s coming at some point soon so it will at least be addressed if not end up happening. A possible explanation is that Jamie fakes their deaths in order to get out of having to obey Governor Tyron’s order to bring in Murtagh. Outside of that I suspect the show and characters will continue to navigate this period of American History while setting up aspects of the oncoming American Revolution.